Apart from all that shuffling of TBR piles (more to come on that theme) I have been knitting. I started and finished a Coquille shawl in Noro Kureyon Sock - all purple, green and grey. I love how it turned out. Not a long or complicated knit at all - perfect TV knitting. It's just right for this colder weather, wrapping round the neck securely and lovely and warm. I then started a shawl that I spotted in the new issue of Spin Off. The pattern called for handspun but I was too impatient to knit it now so I didn't spin the yarn for this. I used a dark green 3ply alpaca from Forsell that I had in the stash. There's nothing to see - it's just a pile of unblocked lacy nothing at the moment. I've been spinning laceweight, using the Very Fast Flyer attachment for my spinning wheel. The fibre is some BFL that I dyed in the summer. It's proving to be very easy to spin finely and I've already plied a small amount - the lace bobbins don't hold a great deal. This is just 15g and of course I've already forgotten the yardage I got. I shall wait until I've spun it all - a couple of fridays at spinning group should finish it off - and then see how many yards I've got before deciding what to do with it. I've been reading too. I had a proof of the new James Lee Burke novel - The Glass Rainbow, due for publication in November. It's a Dave Robicheaux book and I have to say that it is really good though I had reservations about the ending. I'm not going to say any more about the plot than that because I don't want to be spoiling it for anyone. The writing is fine as you would expect from JLB and it has the usual cast of well-known, well-loved characters from Clete Purcell to Alafair Robicheaux as well as a fine cast of secondary characters. I'm just not sure about the end. I had an audio book of Jeffery Deaver's The Twelfth Card which was my book group read for last month. Now I'm quite a fan of Mr Deaver and I've liked most of the previous Lincoln Rhyme books but I'm not sure they are cut out for audio. The pace seemed to be very slow and the plot unnecessarily complicated. The bit where he lists all the clues Rhyme has written on his whiteboard, which I would normally skim over if I was reading, just drove me nuts when I had to listen to it over and over again. The others in my book group liked it, but they were actually reading not listening, so I think if I have one of his to read again I'll take a pass on the audio option and just get the book. Wonderful idea - I wish I'd had it. Other books I've read recently include The Moor by Laurie R King (still working my way through these - all out of order). This one hasn't been republished here yet so mine is an old hardback bought in Hay-on-Wye a couple of years ago. Dark Water by Caro Ramsay - a great police procedural set in Glasgow where the small Partickhill police station is under threat of closure until a big (and nasty) murder case lands right in their laps. I really like this series, very well plotted and with great characters. Stealing Shadows by Kay Hooper - this was my book group read for this month and it was OK but not great. Very similar to Charlaine Harris' Harper Connolly books - psychic woman solves crimes and communes with the dead - a bit run of the mill. I also read Red Dog, Red Dog by Patrick Lane which is set in Canada. It's not an easy read, but it's well worth the effort. Young men scrapping and trying to survive, but beautifully written and very detailed. Like a cross between Richard Allen and Alice Munro. Lastly I just finished The House at Sea's End by Elly Griffiths, (many thanks to Quercus for the proof). This is the third in the Ruth Galloway series. It's difficult to tell you much about it without spoiling the plot, or ruining it for those who may not have read the first two, so I'm just going to say that it is really good and if you haven't read this series yet then you really should, and if you've read the first two then you'll love this third one which is due out in January. I love the character of Ruth - she's a real woman with all the conflicts and problems of a normal woman and crime fiction could do with more like her and a few less of the supermodel crimefighting superwomen who seem to prevail in some books. There is nothing more guaranteed to make me want to put a book down than a stick-thin, super-smart, ultra beautiful heroine, especially if she starts to toss her long red hair. Thankfully there is none of that with Ruth Galloway, who is intelligent, practical and believable. Now I'm on The Reversal by Michael Connolly, another of the Mickey Haller books, just out last week. It's got quite a lot of Harry Bosch in it too which is a bonus. I never did get back to Nine Dragons for some reason but I'm enjoying this so far. 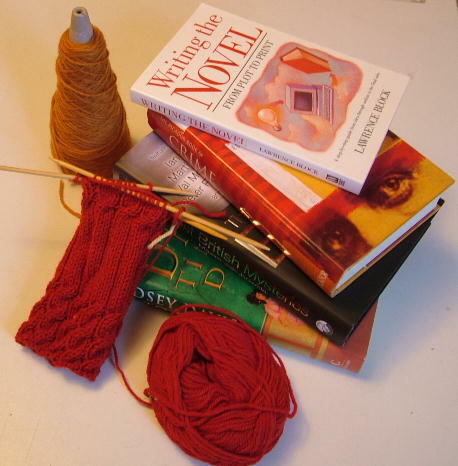 Back soon(ish) with more book and knitting chatter. I'm really looking forward to The Reversal and The House at Sea's End but have not got copies of either (yet?). I love that shawl, what beautiful colours. I think you are too modest when you write that it was not complicated!